We foster an “engineering spirit” that will allow you to boldly rise to the challenges of the 21st century. “Engineering spirit” contains the idea of pursuing engineering as a lifelong path; it also expresses the hope that young people will rise to meet the challenges of today and tomorrow as engineers. In the 21st century, we will be called upon to create a sustainable society in symbiosis with nature, while guaranteeing safety, security and prosperity for all. Young engineers will be the driving force that ensures that we meet these lofty goals, with their passion for high technology and their inventive “engineering spirit.” Toyama Prefectural University offers specialized knowledge and education in engineering disciplines, with 6 courses of undergraduate study and a graduate school with 5 degree programs. 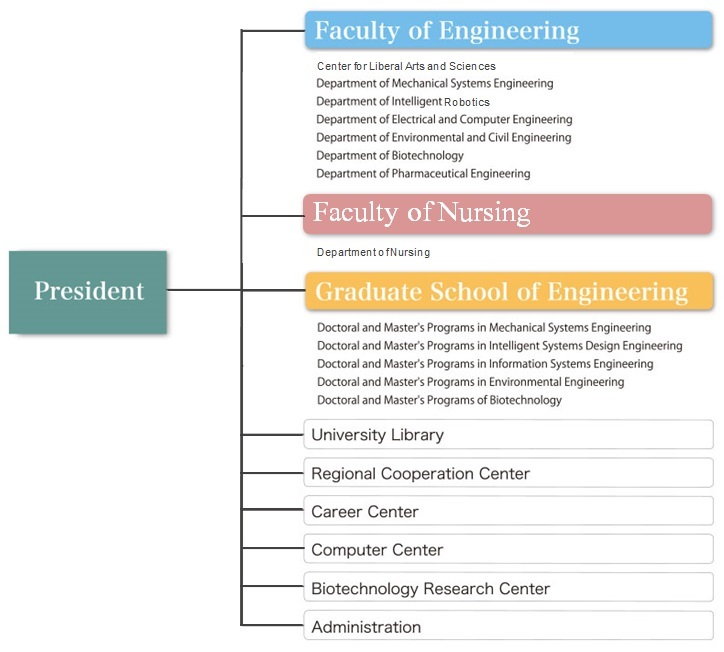 The faculty of Nursing has been added　newly in April 2019, and we are engaging in Nursing – Engineering collaboration. Toyama Prefectural University was founded in 1990 as the first public institute of technology on the Sea of Japan coast. The College of Technology, originally an independent college named Otani College of Technology established in 1962, became part of Toyama Prefectural University.